REGULAR MEMBERSHIP- Hook this has a limited membership of 25 Boaters. SJHT Club Anglers can fish 2 to a boat or single. Membership cost for 2019 is $45. This money will be used to pay for permits, club expenses, help finance the Bass Bowl Team, and prize money for the classic. All membership dues must be paid b4 the start of the season. (January would be great so we have $$ to optain permits) We will have 1 mandatory meeting sometime in February before the season at a time and place convienient to all. Membership Requirements: 1.) Must have a current BassMasters magazine subscription with valid 9 Digit Identification number. 2.) Pay the $10.00 NJ Bass Nation membership fee. 3.) Provide a valid mailing\home address, Cell#, along with an active email address. 4.) 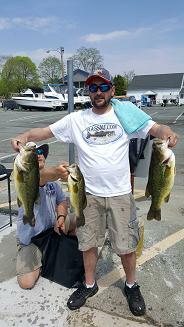 Register and sign up at the NJ Bass Nation Official Website http://njbassnation.org/ to gain insight into News, Highlights, Boater\Rider parings, Boat launch ramps, Start times, angler tournament registration, and deadlines. 5.) Boater?s should have liability insurance. These requirements should be met and submitted to the SJHT President or Officers assigned to carrying out these requirements by the monthly NJ Bass Nation meeting held at the Sportsmen?s Club in Bordentown, NJ every 1st Thursday of the month. For our purposes, this is Thursday, Feb 6th, 2014 7:30pm meeting time. * Members must have Paid & Entered at least a Min. of 6 regular club Tournaments to Stay Active in the Club. *NEW MEMBER PROBATION PERIOD-New members will be under a 3-4 Tourney probation. Basically, if said member is not comfortable or has issues relating to staying with SJHT, then he or she may resign with Club Dues paid back to member a week after notification has been given. This probationary period will also allow for Club officers to review if a members experience can be improved by possibly adding more mentoring or just words of encouragement. We're not here to keep your dues especially if you feel this is not a good fit for you. *All New Jersey boating and fishing regulations apply. Anglers must be licensed and boats registered. Proper boat lighting is required for night T's. * All boats must be powered by electric motors only. Maximum 3. You boat size or style does not matter, Gas motors may be used on the lakes that allow them. * HOOK This!! has 3 fish tournaments. We have a total of 16 T's this year not counting the end of year classic. It is a $15 cost for members to participate in a T. Guests of active members are welcome to fish for $20 (of which $5 goes back to the club).HOOK This!! pays back 100% at weigh-in with a 60%-40% split for 1st and 2nd and $5 goes to the Lunker pool. If no fish are caught, the money rolls over to the next T. It will be evenly distributed in the 1st, 2nd place and Lunker Categories as if it was the previous tournament. * All boats MUST have a Working live-well or cooler equipped with an aerator to sustain a limit of fish. * No member shall help another member by giving them a keeper size fish. If 2 members are fishing out of the same boat , they must have a way of identifying each others fish. exp..quick cull system. Disqualification will result if this is not followed. * Your livewell may never contain a # of fish over the limit. Doing so will result in disqualification. * Trolling is not permitted. This will result in disqualification. * Any member arriving late for a T must have their livewell checked by another member before fishing. * No live bait at any time. Artificial lures only. * Any aggressive or unsportsmanlike conduct is grounds for immediate rejection from the club. This will be done by means of a vote. * All entrance fees must be paid the day of the T before weigh-in. Preferably before the T.
* You must be within NORMAL talking distance from the ramp and not fishing at the designated time for weigh-in. If you are late, 1lb per minute will be deducted from your Total Weight. After 5 Minutes, you will be DISQUALIFIED. * Nets may be used to land fish. Fish may also be netted by another angler in the boat. * No member shall advance a boats position by unboarding it and dragging it over an obstacle. You also must not fish in areas that are considered "out of bounds". Disqualification will result because of this. * Fish MUST be brought to the scale in a weigh-in bag alive. Dead fish will count but there will be a 8oz. deduction. Dead fish cannot be culled. *AMENDMENT#06-01-12 * Any short fish brought to the scales without an INITIAL REQUEST for a courtesy Measurement will result in the loss of that anglers LUNKER BASS and If they only have 1 Bass in total, and they do not request a Courtesy Measurement before the weigh master puts the Bass on the scale, they will be Disqualified recieving No Participation point. A Courtesy measurements will be allowed by request only. If an angler only has 1 bass but it's below the 12" mininum but they requested a courtesy meaurement, the angler will still get the 1 Participation point but No weight of the bass. * REMEMBER- Everyone should have a legit Bass Ruler onboard there boat. Understanding that some rulers maybe a little off, it is imperative that if you are unsure or it's even slightly borderline, one should request a courtesy measurement. * In a case of a tie for total weight, the angler's lunker will become the tiebreaker. The angler with the most fish, then the angler with more weight will break ties for lunker. * Leaving prior to the end of a T will NOT result in a forfeit of their catch for that day. The angler(s) must find 1 of 3 SJHT club officials with the Hand Held Berkley Scales to get measurements to there days catch. Leaving without any measurement will be viewed as no fish caught or counted for that tournament. This ruling is not to be abused and the Tournament Director\President\Vice-President will make the final call. * No member may remove their boat from the water until at least 1 other member is at the ramp. The tournament team has priority at the ramp and should be permitted to use the ramp 1st. * Tournament start times ,end times, location and creel limits are found on the 2019 schedule page. * 2 members will be assigned as the Tournament Team, consiting of Weigh Master and Livewell Checker. They are responsible for livewell checks, all weigh-in duties and returning the fish to the water. The President or vice President will record the results and do the scoring. 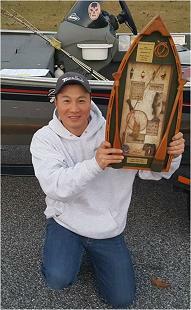 * Points are awarded as a means of determining the Angler of the Year. See 2012 scoring sheet for details. * A guest may fish a T with HOOK This!! by paying a $5 guest fee and $15 T fee. The guest fee will count toward a full membership if a slot is available. Guests must fish from a members boat. Kids under the age of 15 can fish for free. 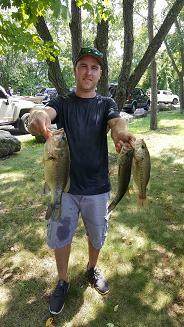 There bass catch will not be counted unless they've Paid Guest Tournament Fees. * We practice ethical angling!! You should not crowd another boat, cut them off or otherwise disrupt the area that they are fishing. 1st one to a spot, has that spot. If you feel someone is too close, or doing something you do not appreciate, SAY SOMETHING TO THEM!!! We are a bunch of buddies who get together to fish on weekends, we are not making a living fishing. Remember it's fishing, having fun, and not a cut throat competition. BE COURTEOUS TO THE OTHER CLUB MEMBERS. * Any and all disputes MUST BE brought up at the weigh-in to one of the President or vice President. If it is not brought up then it will not be addressed later. When a decision is made by the President and or vice President, it is final whether you agree or not. Continuing any disagreement or complaining about decisions made will result in a vote to eject the member from the club for Unsportsmanlike conduct. * This internet site and message board will not be used to "air dirty laundry" . We all will act respectfully to other members and not make personal or derogatory statements about others. Anyone violating this rule will be subject to a vote on Unsportsmanlike conduct and may be ejected from the club. 2- STRIKE RULE & YOUR OUT. Any SJHT member which has been found\reported abusing the above rules or regulations will basically be allowed only 2 infractions. At that time, SJHT officers and Tournament Director will convene to have said member removed from the club. The 2-Strike Rule is not to be taken lightly. If a reported member is bringing Ill-Will to the good of the Club\Association, that could become a sore\virus to the rest of the members. Basically, leave all of your daily work or family issues at the door, and come out to have a good time amongst friends. For the record, we've never had really any potential problems, but it's always good to know where everybody is coming from. I don't foresee any problems, so lets not go there! CLASSIC QUALIFICATIONS. 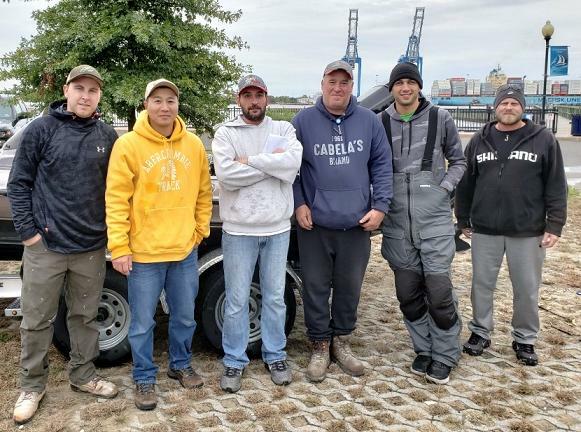 To be qualified to fish the classic, you must be a full SJHT member and satisfy at least one of the following: The rules are the same in the Classic as they are in the reg season. The total weight for both days will win. If there is a tie, the one with the biggest Lunker fish will win on the Final Day. 2- If a member fishes our annual Open Bass Buddy Tournament 4th of July weekend, then that event may also count towards the Classic Qualification. (No points will be awarded towards AOY standings). BASS BOWL- The top 6 anglers in points will qualify to fish the SJBCA bass bowl. The top 3 are LOCKED IN. Starting at the #6 spot, anglers will be dropped from the team until we have 3 adequate boats to fish the body of water chosen by the SJBCA. END OF SEASON AWARDS- 1st- AOY; 2nd- CLASSIC CHAMP; 3rd- LUNKER CHAMP; 4th- HEAVY 3 FISH LIMIT; 5th- IRONMEN-; 6th- ROOKIE AOY; 7th- MOST IMPROVED ANGLER.